Caring Club® is our way of saying “Thank You” for your annual gift of $156 or more to the United Way Community Fund (undesignated gift). Members receive a card that provides discounts at local businesses. Not a Caring Club® member? Join now! Simply donate $156 or more to the United Way Community Fund! 20% off roundtrip fares when purchased online. Non-transferable, cannot be combined with any other discounts or offers. Limit 4 tickets per transaction. Use code: Caring2016 at checkout. $79/year digital subscription. Save over 35% off the regular rate. 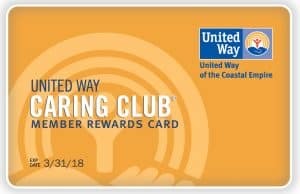 To take advantage of this exclusive offer, call 912-236-0271 and mention that you are a United Way member. This is an introductory rate. Must not have been a subscriber for 30 days.